Like most Iowans, this hometown hero isn't prissy, gets along with just some common-sense care, and can tough it out during harsh Iowa winters. Buck roses are a wonderful, dependable, beautiful group of roses perfectly suited to Iowa because they were bred in Iowa. Back in the 1970s, ISU horticulture professor Griffith Buck was trying to breed roses. But Iowa State, understandably focused on things like corn and soybeans, didn't give him much budget. So Dr. Buck had to breed roses that could do with little spraying, watering, or winter protection. As a result, he created a group of low-maintenance roses right at a time when American gardeners were interesting in such things. 'Carefree Beauty' is his crowning achievement. It is a large gorgeous rose with tiny pink flowers that bloom from June until frost. It’s so tough, disease-resistant, and reliable that it’s been crossed with many other roses to develop new types. In fact, it’s so showy your neighbors will all ask what it is. It grows 3 to 5 feet high and wide. It has been used as breeding stock in many low-maintenance roses over the decades. Buck roses usually have fun Iowa-related or prairie-themed names to boot, such as 'Frontier Twirl' or 'Hawkeye Belle.' ‘Distant Drums’ is one of the most prized Buck roses for its gorgeous, subtle coloration. Below is a listing of Iowa retailers that carry Buck roses, as reported by our readers. If you find a good retailer not listed here, let us know and we'll update this listing. Their availability, of course, will vary through the season. Comments: Owner Larry Larson year after year has one of the most reliable, extensive sources of Buck roses in the state. Thank you, Larry! Comments: Located slightly south of West Des Moines. 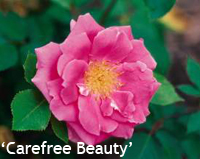 As of early May, they were out of all but 'Carefree Beauty.' They said they can be tough to find Buck roses to carry for their customers, and demand seems to outstrip supply. Herndon's Des Moines Seed Co. The reader didn't specify which one, but a good indicator that sometimes you can find them anywere!